It is very handy to be able to pair multiple headsets to the W440 Savi Wireless Headset when you have a conference call in your office. While on a call, you can subscribe up to three guest headsets to your USB adapter for conferencing. As you add headsets to the adapter, an additional headset icon will appear in the Plantronics Control Panel on the W440 headset, with a number from 1 to 3 indicating the number of guest headsets subscribed to the adapter. 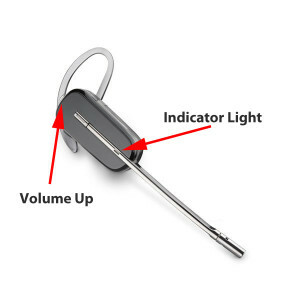 1) While you are on a call, place the guest’s headset into subscription mode by pressing the volume up button on the headset for three seconds, until the headset indicator light turns solid white. 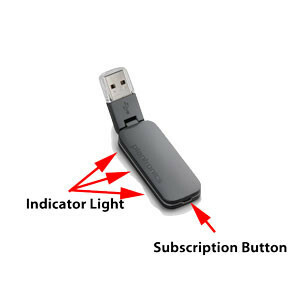 2) Short press (less than one second) the subscription button on the USB adapter. The USB adapter light will flash yellow and green. 3) The USB adapter light will then turn solid yellow, and you will hear a tone in the master headset indicating a guess wishes to join the call. 4) If you press the call control button on the master headset within five seconds, the guest is joined to the call. If you do not press the call control button within five seconds, the request to join the call is rejected, and the guest will hear an error tone in their headset. 5) Guests may leave the conference call by pressing their call control button.